Last month, I was first to blog on the fun site, CubeDuel, which had you picking between pairs of current or former colleagues, selecting which one you would work with again, in a site that closely resembled the often copied but rarely matched, HotOrNot. Last week, a new site entered the foray, taking similar game mechanics, but aiming to apply them to how well you know people's skills, and seeing where you rank. The idea? Possibly using anonymous references to crowdsource the best people on the Web for corporate roles. mixtent asks simply "where do you stand in your industry? ", hoping that your ego will push you to find out just how well you stack up against your peers, and possibly, what this means about you. With LinkedIn setting the gold standard for online resume hoarding and business network connections, its unsurprising other career-oriented, recommendation flinging sites would start with one's LinkedIn network graph to have you start practicing natural selection in the workplace. But while CubeDuel seemed like a harmless game worth about 5 seconds per choice, mixtent hopes to be more. Instead of the game starting and ending simply with picking one person versus another in a winner-takes-all battle for cubicle superiority, mixtent asks you to select the best individual dependent on a specific job skill or trait. The site mines your Linkedin profile for keywords, and quickly has you doing battle for the position of best writer, blogger, editor, director, manager or whatever else you want to be when you grow up. 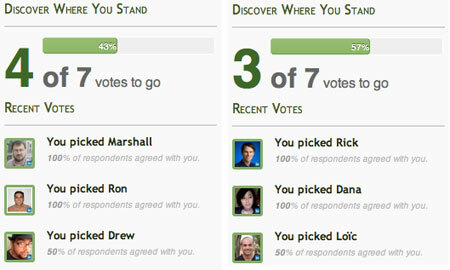 Post enough votes, or get voted on enough, and you can see how you rank relative to your peers. There are even global leaderboards and similar rankings just among your connections. Like most services that dabble in collaborative community voting, the most visible people from external networks perform similarly well on mixtent. For example, the omnipresent Chris Brogan tops both social media and blogging, gaining approval rates (where he was picked over competition) of 96% and 100% respectively. As the site doesn't offer comments, and votes are initially anonymous, there's no insight into the voting, so one's familiar avatar could be all you need to spring to the top. The site encourages you to participate by locking your own rankings' visibility until you make seven votes in the category to pick others. For example, of you have "Oracle DBA" as one of your traits, you need to pick between 7 pairs of people who is the best Oracle DBA. Then you see if you are at the top, around 60th percentile, or surprisingly lower. Oddly, at least to me, you can even force open the ranking of another user simply by voting on them the same seven times. 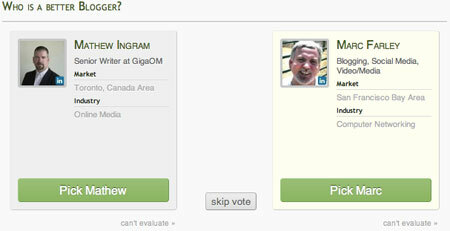 Navigate to another user's profile, click an unopened box, and seven votes later, you can see where they stand. 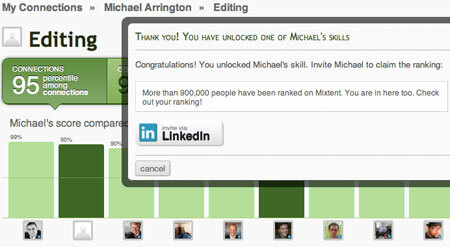 I was able to unlock Google's Bob Meese for Business Development and TechCrunch's Mike Arrington on Editing. Theoretically, if one were to hold a grudge against someone, they could pick all the skills and drive them into the mud with a cute 0 for 7 score, but it appears the system anticipates truth-telling. Who Is the Better Blogger? Mathew Ingram or Marc Farley? How Did I Vote? Initial coverage of mixtent compared the service to another buzz-worthy launch of the last year, at Honestly.com, which was anticipated to provide unvarnished reviews of peers anonymously. (Hence its initial name unvarnished) But mixtent doesn't focus on longform reviews, instead just the raw clicks of the people. Maybe if there is significant volume, you can start to get an idea of who separates themselves as the great from the common, but it's early days. To start adding tallies to the system, head to mixtent.com.